I had a busy, busy Saturday. 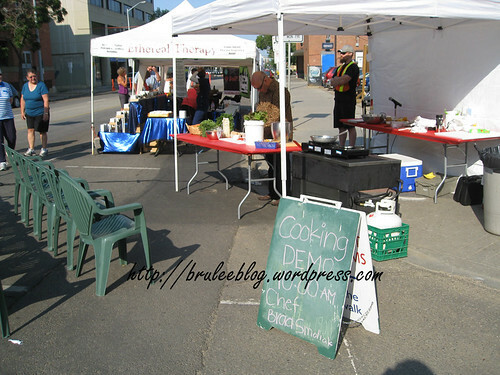 My adventure started with a short volunteering stint as a “food sample girl” over at the downtown City Market. 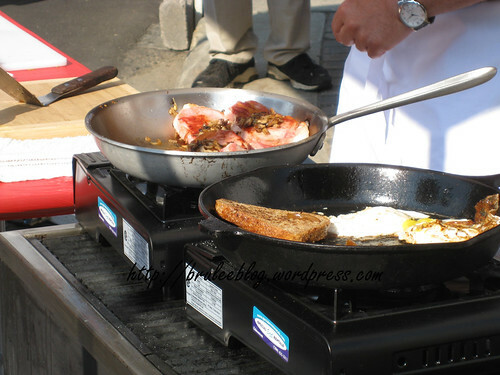 Saturday was Canada Food Day and to celebrate, the City Market held a number of food demos from chefs. 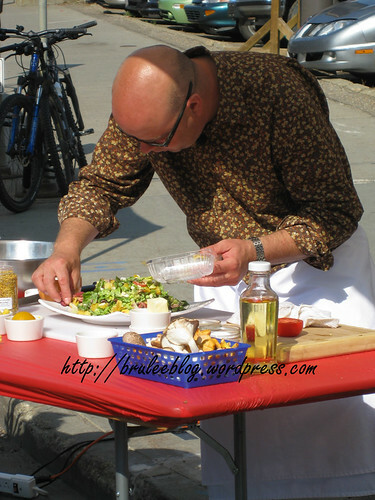 Once the food was made, I helped to distribute the goodies out to the hungry crowd (at least, for the first demo). 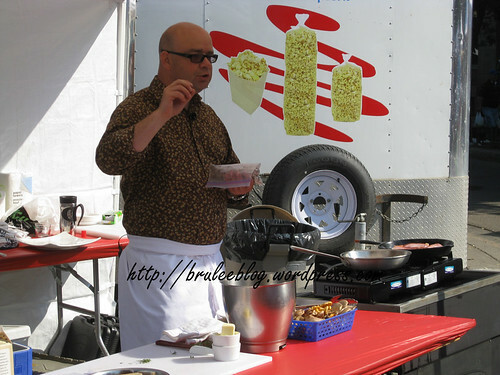 The first demos were from Chef Brad Smoliak, whose first recipe was Ukrainian Eggs Benedict. 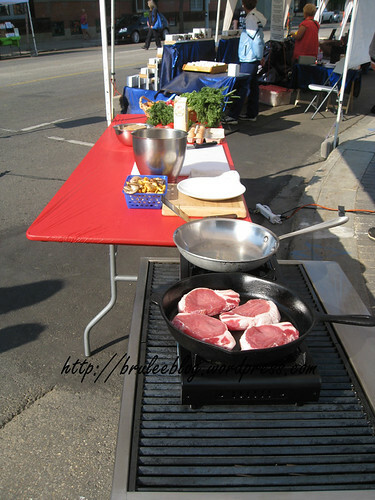 Chef Smoliak started off by doing some prep work, including putting the Irvings Farm Fresh pork chops (or, as the Chef called them, bacon chops) in a pan to begin frying. 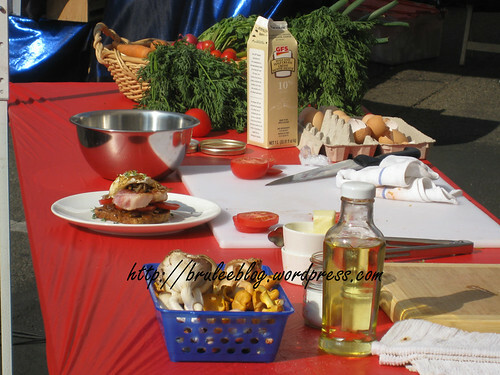 He cooked Mo-Na mushrooms, fried eggs, flipped the chops… the smell was torturing everyone in the audience. The final product looked like a giant open-faced sandwich. And it probably could feed at least two people. 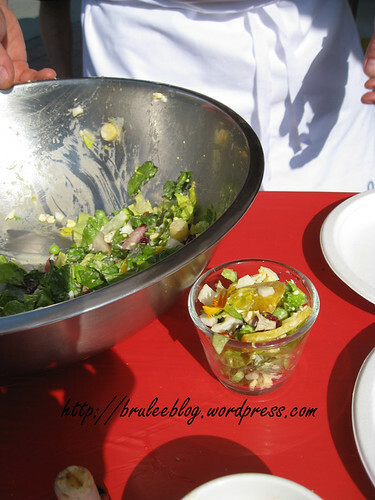 My duties were over, but I stuck around to catch the second demo where the Chef presented a summer salad. 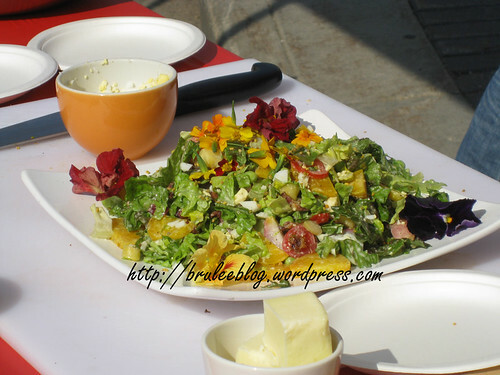 One of the Chef’s last tips was that if you were doing a buffet style party then you might want to pick up some candle votives and utilize them to serve the salad. I’m not sure if I would use votives though, unless you were sure that the vessel was safe to use with food. I’ve seen this technique used in Las Vegas, although they used cups that were smaller, like shot glasses. Also hanging around the market was fellow volunteer Eating is the Hard Part, and Only Here for the Food who was helping to man the Slow Food Edmonton booth. So what did I do for the rest of the day? Well, if you have been following my tweets then you’ll know. Otherwise, you’ll have to wait for my next post to find out what happened next. No, but I did go somewhere else! Stay tuned. Can’t wait to have you back! !